A hypo (hypoglycemia) is triggered when blood sugar levels fall under 4.0 mmol/L. Too much insulin or too little food can spark a hypo. This guide details what hypoglycemia is, how to recognise hypo symptoms, and what to do when you or your child is suffering from a hypo (hypoglycemia). What are the symptoms of hypo? Symptoms of hypoglycemia vary from person to person, but people with diabetes should learn to recognise their own signs in order to treat the hypo as quickly as possible. What to do if you think you/your child is having a hypo? If you, or your child, may be having a hypo, it’s often worth checking blood sugar levels as soon as the symptoms are noticed. However, if testing could delay treating the hypo by more than a minute or two, it is better to treat the hypo immediately and test as soon after as you can. 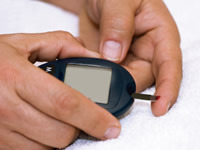 The priority is to bring blood glucose levels back up to normal as quickly as possible. Chocolate can be used if little else is available. However, note that the fat in chocolate slows down how quickly the sugar gets broken down, so use sugary foods without fat in where possible. If someone is unconscious or has a seizure this is a severe hypo. Read more on the symptoms and treatment of a severe hypo. Download a FREE hypo factsheet for your phone, desktop or as a printout. Always test your blood glucose 15 minutes after the initial hypo treatment to check whether your sugar levels have recovered to normal levels. If your sugar levels are still too low, below 5.0 mmol/L, repeat the hypo treatment. What is Glucogel and how does it help hypoglycemia? Glucogel is available from your healthcare professional, and he or she should be able to tell you how to use this to treat a hypo. Glucogel can be administered when glucose tablets of Lucozade may not be safely given. Glucogel is administered to hypo patients by putting it into the side of the mouth and rubbing it into the cheeks. Glucogel can be obtained on prescription from your GP. Make sure that the glucogel you use is in date. Glucagon is used to treat serious hypo symptoms, including collapse and fitting. Glucagon can be administered via subcutaneous (under the skin) or intramuscular (direct to muscle) injections.For people that are fitting or unconscious, hypo treatment should not be administered by mouth. Directions for use should be included with the product or your healthcare professional should be able to advise you. The prefilled syringe should be injected into the glucagon vial, this should then be shaken until contents dissolve, the solution should then be drawn into the syringe with all air removed. So in the case of serious hypo what should be done?